I would like to let readers know that I have released an interview with Michael Watson a former member of the Greys Scouts, a horseback light infantry unit in the Rhodesian Bush War. It is not a very well known unit but deserves attention by military historians. Thank you to Mr. Watson and the best of luck with his future endeavors on writing his compilation and hopefully, we can get some more info up on SOFREP.com about specific dust ups and ops. Please read and post it on your facebook, twitter, etc. I am reposting the three part article I wrote for http://www.sofrep.com a couple of months ago. They are the finest website by far regarding Special Operations and related topics. Thanks to Jack Murphy and Brandon Webb for allowing me to contribute to their site. BTW, I will soon be releasing a series on the history of the Rhodesian SAS, C Squadron during the Bush War. The helicopter has become an iconic image of war. It changed the way soldiers were able to deploy on the battlefield, dramatically reduced the mortality rate of wounded soldiers and delivers hell fire and brimstone to the enemy. To most Americans, the Bell UH-1 Huey in Vietnam was synonymous with the war itself. To the soldier in the field it was a ride in and a lifeline out. The American military first saw its utility in the Korean War as an airborne ambulance and cargo carrier. The technology for an offensive weapon did not yet exist. However, the British were putting the new aircraft to good use for counter insurgency missions by the SAS and SBS in the Malayan Emergency that was fought between 1948 and 1960. Special troops were infiltrated and ex-filtrated deep into the jungle, bypassing traditional methods of troop movement with great effectiveness. The platforms for offensive capabilities began to emerge and platforms such as the Huey and Cobra gunships came to prominence on the battlefield. They have continued to improve and are integral to the missions carried out today. It is a tool that our enemies fear. With the start of the Cold War, the United States trained its military to fight against the Soviet Union in set piece fashion. The Korean War was fought against a uniformed and recognized foe. Vietnam threw a wrench into the status quo, yet the veterans and policy makers who had lived through and fought World War Two tried to apply traditional methods and tactics at a guerilla army. Late in 1965, when the first air-mobile teams fought in the Ia Drang valley against regular NVA formations, they did well. It was a morale booster for the Pentagon and the public that we could insert troops via chopper onto the doorstep of the enemy and defeat them. History then tells us about the failure of the powers that be to further adapt methods to fight against a guerilla army. Colonel David Hackworth recognized this early in the Vietnam War and wrote the famous ‘Vietnam Primer’. He believed that with superior tactics and mobility we could learn to fight the VC and win by, in his words-, ‘Out G-ing the G’. 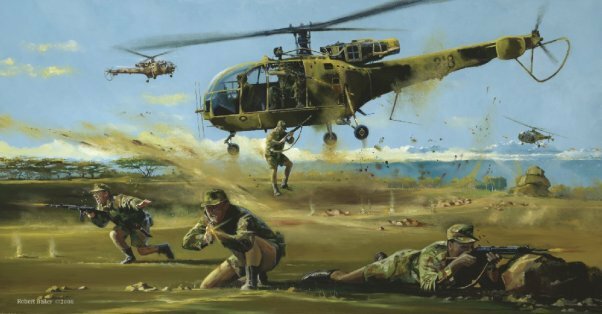 Perhaps the most innovative use of the helicopter and Special Forces in Vietnam was the Mobile Strike Force and the lesser known Eagle Flight, a heliborne tactic to find, fix and kill the Viet Cong. The Eagle Flight typically consisted of 11 helicopters, six carrying paratroops and the others acting as gunships. Soldiers were set down in strategic positions to cordon off groups of insurgents, either closing with them on foot or being blasted from above. Due to the terrain of Vietnam, it was often difficult to find the ideal kill zone. While the Hot Spot for the Cold War was winding down in Vietnam, the African Continent was waging its own war against Communism. The power vacuum left by the decolonization of several nations allowed Soviet-bloc and Chinese backed revolutionaries to set up power and fight their way into power. A small, independent country stood alone and against the world and the Communist tide. Battered by sanctions and abandoned over politics with the U.S. and Great Britain, the nation of Rhodesia was enduring attacks and infiltrations of its sovereign borders. Communist Terrorists were harboring in Mozambique, Zambia and Botswana and making incursions into Rhodesia, killing farmers, destroying livestock, crops and creating a panic amongst the native tribes and the general population. Backed by the Chinese and Russians, Robert Mugabe’s ZANLA and Joshua Nkomo’s ZIPRA forces, intended on ‘retaking’ Rhodesia from the Ian Smith government and ‘restoring’ proper ownership to the envisioned nation of Zimbabwe. Early CIA records show that the Johnson Administration recognized that this ‘Freedom Movement’ was clearly an attempt to expand Communism. Great Britain resented the declaration of independence of Rhodesia in 1965 and was not interested in helping the wayward nation in retaining it freedom. Ronald Reagan addressed Rhodesia in a 1976 radio broadcast, recognizing their fight against Communism. The Rhodesians were on their own to preserve the land that they had cultivated into the literal Breadbasket of Africa. From the early sixties onward, they were faced with a ruthless insurgency. Though they offered troops in World War Two and the Malayan Emergency to their former patron, Britain, their own standing Army was very small and their main defense force was the British South African Police and Reservists. It has been stated that even at the height of the insurgency, the Rhodesian Light Infantry never had more than one thousand fighting men on the ground in action at any given time. With thousands of miles of borders to protect, the aim of the Army was to meet problems with solutions that worked rather than adhere to Classical doctrine for the sake of doctrine. Several soldiers that had served with the British SAS during the Malayan Emergency understood the nature of this type of warfare and were able to help put together an Army suited to the task. This drive to protect the only place they called home produced concepts and soldiers that are still studied today to learn lessons that can help our current struggle against Insurgents world-wide. With the 1964 murder of the farm family of Petrus Oberholtzer by ZANU terrorists, the Rhodesian Bush War began in earnest. Political dissidents were imprisoned and an attempt to maintain the safety of the nation went full steam ahead. Along with reactivation of the Special Air Service in the early 60’s, more and more men were recruited to join the Army. Rhodesia needed fighting men and solutions to effectively stop a numerically superior force.